Type the title of Dylan Thomas’s Villanelle ‘Do not go gentle into that good night’ into the Google search engine on the world wide web; tell it you want those exact words, in that particular order, and it will provide 21,000 direct hits. 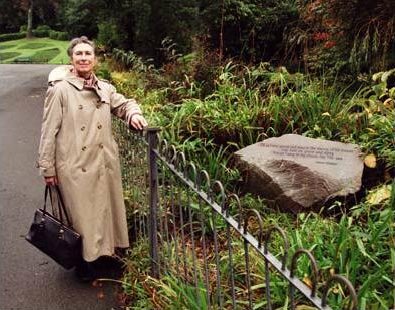 A few of these responses are scholarly in tone, but most come from individuals stirred by the Welsh poet’s passionate protest against his dying father’s loss of faculties. Often the text of the poem is written out in full as a memorial to a loved one. Half a century after his death in New York in November 1953 Dylan Thomas still has the power to move. He always had a special ability to engage his readers and listeners directly, while still providing enough interest, through his intricate word play and rhythms, to excite the most severe of poetry critics. So you can find him depicted on Peter Blake’s cover of the 1967 Beatles album, Sgt Peppers Lonely Hearts Club Band, and also represented in the austere pages of The Criterion magazine. Not many artists were favourites of both John Lennon and the determinedly high-brow T.S. Eliot. 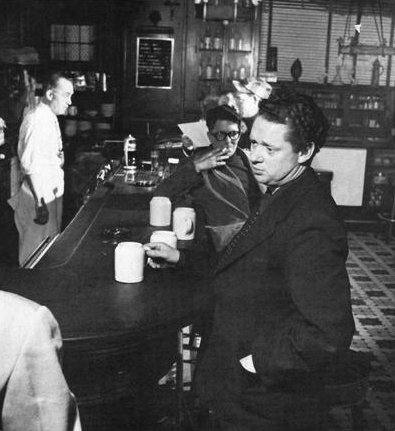 Dylan Thomas’s across-the-board appeal encouraged me to write his biography. As the Beatles recognised, he is an important figure in twentieth century culture, bridging the gap between modernism and pop, between the written and spoken word, between individual and performance art, between the academy and the forum. 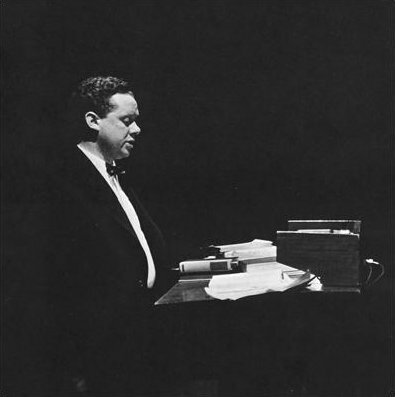 Thomas died in New York on the 9th of November 1953. During his time there he was recording readings of his poetry for the Caedmon Record Company. The first poem he recorded was ‘Do not go gentle into that good night’. Spoken word records were almost unheard of then. 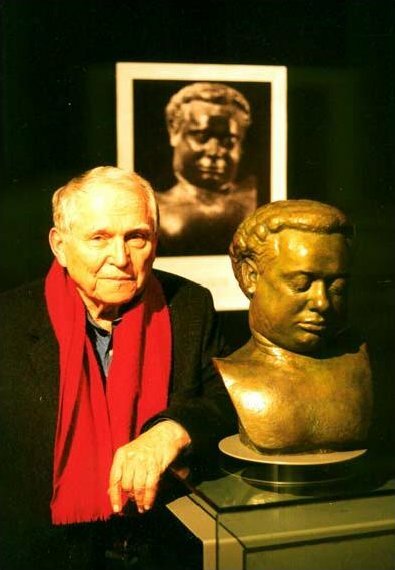 The day after he died, a death mask was made by his friend, the sculptor David Slivka. A bronze cast of this is now in the Dylan Thomas Centre, Swansea. No moving pictures are known to survive him. Unfortunately the film footage made for the BBC was later destroyed. The aim of this project is to produce a 3D talking head of Thomas reading the poem, using the death mask, photographs and voice recordings made at the time of his death. A strikingly vivid, realistic performance made believable through the medium of 3D computer graphics in digital form that has never been seen before, is the culmination of this project. This short pilot video on DVD, approx 1.5 minutes in time will form the platform from which, the first visual talking book can be made. A preview of the final head will be shown as part of the MA photography exhibitions in Swansea and London in June. This should ensure the maximum international publicity for both Swansea as a cultural centre and South Wales as leaders in new methods of 3D virtual animation. This final project has developed during the two years of my Masters Degree at the Swansea School of Art. However, this is only the result of a long journey, which began in the 1960’s. It is important to survey this in an historic context, to understand the evolution of the Virtual Dylan Thomas. Before leaving Swansea in 1965 I had discovered through the paintings of Ceri Richards that Dylan Thomas was the catalyst at the centre of a larger group of artists and writers that emerged from Swansea in the 1930’s. During my time at the Berkshire College of Art, Reading, the lecturer in portraiture and lighting was Gilbert Adams, who, like his father Marcus was a master in the control and use of light. He had a great influence on my work at this time. In 1966 I returned to Swansea to produce a series of portraits of the group of friends that surrounded Dylan Thomas, including the artists Ceri Richards and Alfred Janes, fellow poet Vernon Watkins and composer Dr Daniel Jones. The only person missing was Dylan himself. In 1996 I wrote an article, ‘The Swansea Gang’ for Planet magazine No.120. The accident of your place of birth is a funny thing. Who would think when travelling down the valley through the grimy terraces of Plasmarl and the Hafod, that you would emerge to the freedom of the Bay and the ever-changing sea. Out of this magical place came a group of people whose creative talents would help change our view of Wales. But the fact that they were all born in Swansea was not the only common factor. It was more importantly the poetry and friendship of Dylan Thomas which acted as a catalyst to their individual work. Perhaps this story should really start at “Ralph the Books”, Alexandra Road. Walking past the newspapers, cigarettes and washing line of dirty mags, I entered an Aladdin’s cave, past the 1/- paper-backs into a darkly lit emporium where on the wall of books above a small sign stating “Welsh” hung a small oil of Dylan. This was my introduction to the man. I never met him in real life. The realisation of the importance of recording the living artists and writers of Wales for posterity was a turning point in my career, and in 1996 I left my job as a newspaper photographer to concentrate fulltime on the task. During this time, I constantly reviewed the form and content of the portraits. Changing format and searching for ways of expressing an extra element, an emotional response, were my objectives. The subjects became statues in their own environment, surrounded by personal objects which overwhelmed the individual. The exhibition, Photographs of Artists opened in July 1999 and included some of the early work. Opening on the same day at the Aberystwyth School of Art Gallery was an exhibition of work by the Austrian photographer Erich Lessing. He,like myself, had spent a lifetime career as a photojournalist, and in 1956 his work changed direction. He had embarked on a series of new images that he describes as “Evocations”: studies of absence and presence. Interior landscapes, portraits of the absent dead, was the theme. My second photographic life actually began in 1956, on Mozart’s 200th birthday. To mark that occasion, together with the filmer Walther Stoitzner, I developed the idea of depicting Mozart’s life theatrically, but with authentic documents. The aim was to recapture something of the atmosphere of the 18th century. This is how the “Evocations” evolved. I know our conceptions could never completely reproduce what life was really like in earlier centuries but all the same I wanted to penetrate a little into those times and to recreate them as far as possible. At this point I had taken the documentary portrait as far as I could, and saw in Lessing’s work the opportunity to recreate the missing link in the Swansea Gang, the poet Dylan Thomas. Six interior and exterior landscapes, each photograph printed digitally with lines of his poetry in his own hand writing were the result. These were shown at the exhibition, The Great, The Good and the Dead, at Swansea University’s Ceri Richards Gallery in 2003. 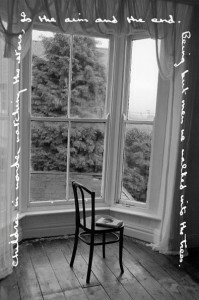 Two of these images included the poet’s empty bedroom in the house where he was born in Cwmdonkin Drive, Swansea, and his death mask outside the Dylan Thomas Centre, with lines from the poem Do not go entle into that good night. Still unsure of my direction, I decided to take two years out, and study for a Masters Degree at the Swansea School of Art, enrolling in October 2003. This dual approach to the investigation raised the same questions of presence and absence. In the first year, my work concentrated on deconstructing the portrait, looking at the work of Bill Viola and the photographer Robert Adams, for ways of expressing the absence of the subject, and its relationship with the internal and external landscape or environment with our outer and inner selves. This resulted in the 3.5 minute video The Blue Road. The work of the Irish photographer John Gerrard was of particular interest. His 3D interactive heads, produced using a 3D scanner and software derived from computer games were, like Barthes’ and Inghams’ an emotional response to the tragic death of a relative: his brother. Displayed on digital flat screens these interactive 3D portraits of real people become detached from the traditional static nature of the photographic portrait into a new genre that can develop as something fundamentally moveable and adaptable. A virtual presence is revealed. In his artist’s statement in the catalogue for his exhibition New Work in New Media at the Dublin Gallery of Photography in October 2003, Gerrard remembered his discovery of 3D scanning. In October 2001 David Slivka visited Swansea for the annual Dylan Thomas Festival. I met and photographed him with the bronze cast of Thomas’s death mask that he had presented to the Dylan Thomas Centre. The presence of the head in Swansea gave me the idea to take the work of John Gerrard one step further. The applications of 3D scanning up this point had been largely used in the fields of medical science in the areas of maxillofacial prosthetics and plastic surgery and in the engineering industry to capture prototype designs, for the production of moulds. time of his death at the StVincent’s hospital in New York, Catlin (his widow), was an in-patient at the Riverside psychiatric clinic, unaware of Thomas’s death, she was picked up the next day by Rose Slivka. With the help of research assistants Domenic Eggbeer on camera and Richard Bibb on computer, the head was scanned some twenty times, rotating it 360 degrees in both its vertical and horizontal axis. These individual scans were aligned to make a complete 3D point cloud of the entire head, which was then polygonised and exported as an STL file for future use. On completion I took the STL file to Morriston Hospital where, with prosthetist Peter Evans, we wrapped the polygon mesh with virtual skin, using software normally employed to train neurosurgeons. 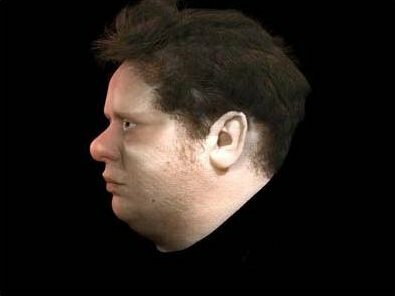 I had completed the first step of making a virtual clone of Dylan Thomas, to put together the digital collage that would create a photo-realistic image of him. To complete the virtual head I would also need photographs of Thomas taken around the time of his death and his voice recorded by the Caedmon Record Company. Some of the finest photographs and perhaps the most comprehensive record of Thomas’s later years, were taken by the American photographer Rollie McKenna, in New York and also on her two visits to Laugharne in Carmarthenshire, from which some rare colour prints survive. A selection of these pictures will be used as visual reference to texture fine detail onto the face of the virtual Dylan Thomas. Whether taken when he was reading his work at the Steinway Hall or relaxing in the White Horse Tavern, these photographs will bring to life the still image of the death mask. In my own experience photographing the writers and artists of Wales, some become more than just subjects. It was the same for Rollie McKenna, for over the last few years of his life a friendship developed between the photographer and both Thomas and his wife Caitlin. In his introduction to Rollie McKenna’s Portrait of Dylan her close friend and working partner at the Poetry Centre in New York, John Malcolm Brinnin, describes the method and style of her work. A photographer who can bring a twinkle to an apostolic eye of T. S .Eliot, catch Robert Frost as the sage of woodlands wild and, from the ageing W. H. Auden, evoke the look of a startled faun, is obviously one able to command many kinds of attention. How Rollie McKenna does it remains a secret, perhaps even to herself. Working in New York at this time were two young women, Barbara Cohen and Marianne Roney, with an ambition to record for posterity the voice of Dylan Thomas. Little did they know that they were participating in a historic literary event. The creation of a new genre, great writing, like music is better performed and who better to do it than the poet himself? The talking book as we know it today had arrived. Under Milk Wood in which actor David Jason played his first cinema screen role. American Poet Laureate Billy Collins relates, in his introduction to the boxed set of CDs Dylan Thomas, The Caedmon Collection published by Harper Collins in 2002, from previously published Caedmon LP liner notes, the story of how the first recordings were made, `It was at the end of January 1952 when Barbara Cohen and Marianne Roney sat with Dylan Thomas in the bar of the Chelsea Hotel and persuaded him to record some of his poetry. Spoken word records were almost unheard of then, and Miss Cohen and Miss Roney fresh out of college, must have seemed to Thomas like two more of the groupies who threw themselves in his way wherever he travelled in the United States reading his poems. The girls were, in fact not groupies at all, and did not even know that Thomas was a stage-door lion. They knew only that Thomas’s poetry was shocking, moving and important, and that they wanted to record it to preserve the sounds Thomas heard in his head when he wrote. Between the offer to record him and that meeting at the Chelsea, they heard Thomas read at the 92nd Street Y. There they discovered what all those know who have heard him on records since – and these listeners far outnumber those who have read him in print – that Thomas was unique: at once the contemporary poet and the traditional bard. He wrote to the thunder of his voice. His poems are nearly inconceivable with out that voice. February 15th came and went without Thomas. A friend claimed to have put him into a taxi en route to 57th Street, but he never made it – the White Horse Tavern was closer and beckoned in a friendlier way. It is difficult to imagine how much nervous energy was expended in trying to find the lost poet and rescheduling his recording session. On February 22nd Thomas was accompanied by a messenger who delivered him more or less on time. The recording was made by Peter Bartok, son of the composer Bela Bartok, who set up his equipment in Steinway Hall. 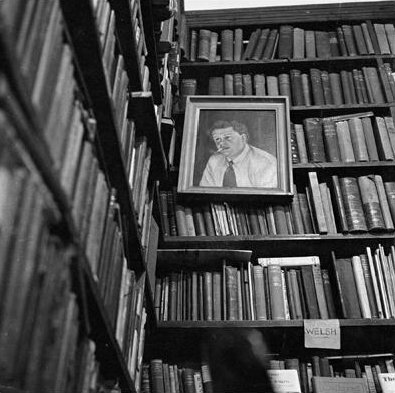 The books of Thomas’s poems – thin, more binding than poetry – came perhaps from the only store in New York to stock them, the Gotham Book Mart. My first approach was to Martin Capey. (Head of School of Digital Media at the Swansea Institute, based at the Mount Pleasant Campus, part of which was the original Swansea Grammar School where Thomas was a pupil). He explained the complex nature of 3D computer generated images (CGI) and the implications of cost in both time and software that were required to put together the virtual head of Dylan Thomas, within the Institute. In November 2004 I attended the five day Sand: Swansea Animation Days Conference, an annual event organised by the School of Digital Media at Swansea University. One of the many interesting speakers was Luc Froehlicher, head of the 3D Department at La Maison, France. Froehlicher had worked in the CGI industry for fifteen years and was responsible for the computer graphics in the award winning film, The Man Without a Head in 2003 by Juan Solanus. This twenty minute film, was four years in the planning and two in the making, but showed the potential for a similar venture of a virtual Dylan Thomas using blue screen technology. At the conference I met Jake Major, of the Swansea based 3D animation Company ‘iCreate Ltd.’ Major had graduated from the School of Digital Media in 3D animation in 2003 and with Dawn Lyle who was a graduate in media, launched iCreate Ltd. Also working for the company is 3D animation graduate Liam Tandy. Time is of the essence in putting together this jigsaw puzzle. I sought advise from ‘iCreate’ regarding costs in creating the virtual head, within the limits given to launch the project in New York in November 2005. The following words are from iCreate’s proposal. We propose to create a photo-realistic, believable performance of Dylan Thomas reading his poem: Do not go gentle into that good night, through the medium of 3D computer graphic animation. It is important to us that our final product is of the highest quality and it is for this reason that we will be using the original Caedmon recording of Dylan Thomas reading the poem and a 3D scan of Dylan Thomas’s authentic death mask, currently on display at the Dylan Thomas Centre in Swansea. We will be basing our animation performance on motion capture and video recordings of a professional actor delivering a reading of the poem in the style of the audio recording. We believe that the bringing together of these elements and the technical and artistic skills of our computer animation team will enable us to recreate Dylan Thomas in a strikingly vivid, realistic way that has never been seen before. t is our hope that this project will make the work of Dylan Thomas accessible to a new generation of Welsh artists. We also see that this high profile project will play a role in establishing Wales as a centre for high-end computer graphics animation. We expect the project to attract media attention. The recreation of an animated Dylan Thomas in digital form. To complete the project in the time scale for my Masters degree and launch the virtual head in New York in November, was an ambitious scheme. However with iCreate’s enthusiasm, I began the task of raising the money to pay for the production costs. An initial application to NESTA for funding was turned down. However, with a £1,500 grant from the Welsh Development Agency, match funded by myself, work on the first stage of modelling the virtual head began in May. 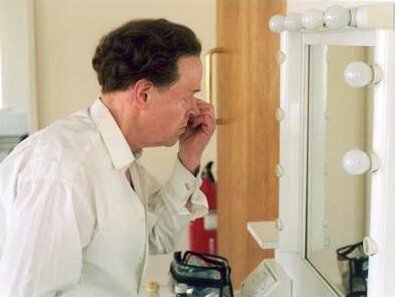 On 18 of May the actor Bob Kingdom, well known for his one man stage depiction of Thomas, was filmed at the Dylan Thomas Centre Theatre. 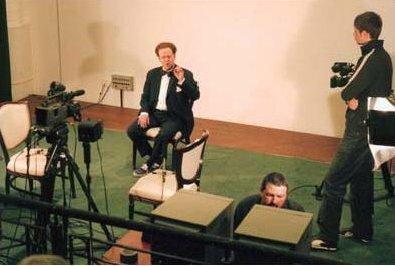 Two broadcast quality video cameras were used to capture the facial movement, operated by Nigel Burden of Pro-Vision Video Productions. To protect the intellectual property rights of the virtual Dylan Thomas, and promote the future development and use of the animated head, I formed the production company Bvirtual Ltd.
To give momentum to the second stage of fund raising to complete the lip-syncing and animation of the head, I decided to take advantage of Bob Kingdom, dressed in bow tie and wig, to launch the Virtual Dylan Project to the media on the same day. The results were impressive, with a full page in The Western Mail, a mention in The Evening Post, BBC Wales radio, BBC Wales/News website and BBC television, Wales Today. Unfortunately this was rescheduled to a later date because of the announcement on the same day of the bequest of Richard Burton’s papers to Swansea University. Two famous Welshmen on one day was just too much! 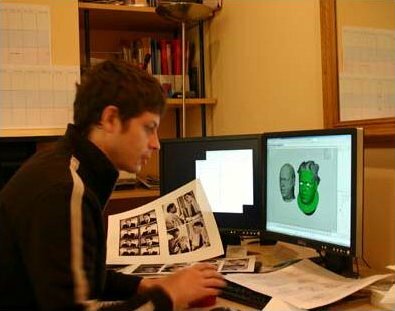 The virtual head of Thomas was taking shape in the offices of iCreate, his eyes now open again and real hair growing on the bald head of the initial model. Major telephoned to ask if they could photograph my face for close-up skin texture, apparently my blood shot eyes and beer blotched skin were ideal material to wrap the virtual Thomas’s time worn face! Like Thomas, my life seems to revolve around a never ending struggle to raise enough funds to survive, and this ambitious project is typical. I plan to show the textured virtual head at the Second Year Photography Exhibition at the Townhill Campus and at the Old Brewery Gallery in Brick Lane, London in June. Moreover funding achieved the animated talking head is scheduled to be completed by the end of July. Thomas’s iconic face like that of Andy Warhol’s Marilyn Diptych, has been seen so many times that, some even say that they have seen it move. But in its movement, this reconstruction of Thomas, is not a memento mori. Through the quasi-filmic nature of the poem, Do not go gentle into that good night, it questions the issues of presence and absence, arising from the way its visual images are ‘framed’ by the two repeated refrain lines, ‘rage, rage, against the dying of the light’. This is not an elegy for the death of his farther, for an elegy laments what is past, but what’s called a proleptic elegy, that is the mourning of an event before it happens. His father’s and his own short-comings before his own yet to be premature demise. The advent of digital imaging over the last thirty years combined with ever increasing computer power and software development has revolutionised the traditional practices of photography and 2D graphics. Today we are at the beginning of a new era of 3D computer generated images (CGI). Initially developed and used in medicine and the engineering industry, it is rapidly being taken up by artists and film makers. In his book Moving Pixel, Peter Weishar describes the growth of the CGI industry. Mention the European Renaissance, Cubism, Abstract Impressionism, or any other major art movement and art history students can name the artists and thinkers who consciously help shape it, both intellectually and by example. The same will be true for CGI. It has not become what it is out of happenstance or merely as the result of increased computer speed coupled with better software. It is a new way of making art, conceived and brought to life by brilliant and dedicated individuals who one day will be recognised alongside the other great artists who have developed our culture. In my own career as a photographer since the mid-sixties, I have witnessed the progress from glass plates to digital cameras embodied in mobile phones that can transmit an image across the world in minutes. In the film industry, Sony, Pixar, Industrial Light and Magic and other major visual entertainment companies have created virtual actors, some digitally resurrected from the dead for a posthumous acting career. In January this year, digital animator Daniel Robichaud exhibited his sixty second film Digital Marlene, at the Science Museum in London exhibition Future Face. 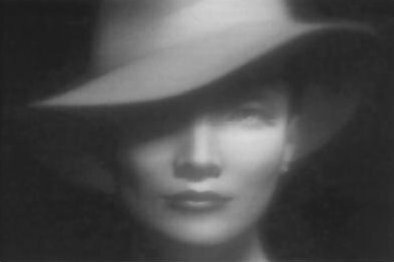 This beautifully made black and white virtual talking head of Marlene Dietrich was created in the style of a 1930’s movie for Virtual Celebrity Productions, now the licensing and merchandising company Global Icons which aims to protect and merchandise the celebrity as a brand. 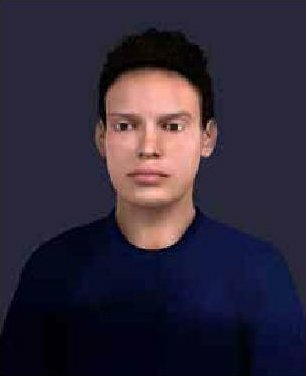 Computer generated virtual celebrities had become a reality. 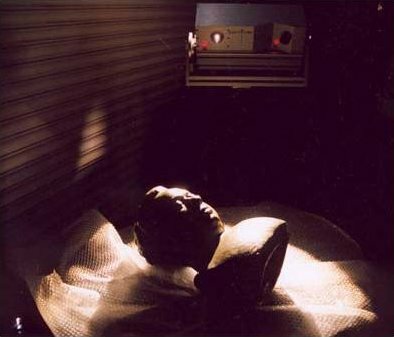 The reconstruction of Thomas’s virtual head does not have the advantage of moving pictures taken from life, but is constructed using the physical facts of the death mask, and photographs taken at the time. His voice is his own, but even that is the voice he used when reading on stage and not in every day conversation. It would be foolish to claim that I have brought to life again the real man. Until recently, animators have tried to create the perfect face based on the standard ideas of beauty. It is however a fact that no human face is totally symmetrical and free of any imperfection, and this is certainly true of Thomas. It is not my wish to create a new iconic vision of the dead poet, but merely to bring into existence a believable performance of him reading his work. Once finished, the virtual head has many applications, and could possibly be shown at the permanent exhibition at the Dylan Thomas Centre. It must be considered as work in progress, for the finished head could be placed on the body of an actor and used to produce the first commercial DVD of a virtual poet reading his work. Thomas could walk again in Cwmdonkin Park or relax over a pint in the bar at Browns Hotel in Laugharne. He could be the first of many writers to be recreated, the Caedmon Record Company carried on to record other writers, including Ernest Hemmingway, and T.S. Eliot. With the growth of mobile phone technology, could the virtual 3D head of a poet be more interesting than a dancing frog?